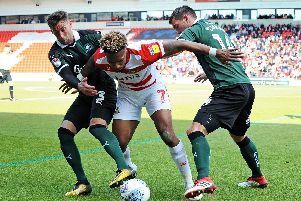 Darren Ferguson wants Doncaster Rovers to make life easier for themselves during a hectic run-in - by continuing their winning habit. Rovers face the unusual and unwanted prospect of ending the campaign with six games in 19 days following cancellations against Bury, Blackburn Rovers and AFC Wimbledon. They travel to Gillingham today on the back of wins against Bradford City and Blackpool and Ferguson is understandably keen for the winning feeling to carry them through the final month of the season. “I’ve never experienced anything like it, I’ve got to be honest,” said Ferguson, reflecting on the revised fixture list. “It’s going to be fast and furious. “We can make it a lot more comfortable and easier for ourselves if we find a way of winning the next couple of games. “If you do that then you’re probably wanting as many games as possible in such a quick time, because momentum will carry you through it. “The good thing for me is that, touch wood, I’ve got 21 players training and I’ve got [Tom] Anderson coming back. I’ve got a lot of bodies there, which I need, and which I’ve not said often this season. “But we’re only focusing on Gillingham and then we’ve got another gap until the Milton Keynes game. In contrast to Rovers, the Gills have lost their last three games. Ferguson said: “A heavy defeat at Southend will have hurt them but they’re a good team and they’ve got really obvious threats that we’ve gone through at the training ground.